We are counted as one of the chief Ajowan Essential Oil Exporters and Suppliers in India. Ajowan Oil is extracted from the seed of Ajowan plant. It is available in clear as well as golden liquid form. 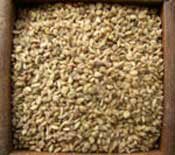 Ajowan Seed Oil is soluble in alcohols and other essential oils and insoluble in water. Pure Ajowan Oil is used as perfumery raw material and also utilized as Spasmodic, Carminative, and stimulant tonic.